Ong Bun Pension House Bacolod is a pension house located within Bacolod City in Negros Occidental. It is one of two pension houses owned and operated by Ong Bun Pension House. I stayed here for one night on August 29-30, 2013 with two old office mates, Chenie and Lindsay. This was during my first time in Negros Occidental, the 24th province on my list. When we arrived at around 12:30 p.m., the staff at the check-in desk told us that there were no available Triple Superior Rooms at that moment but a room may be available by 1 p.m. Adding that we can eat our lunch first and come back later. Since we already had our lunch at Manokan Country, we decided to just sleep at their sofa. At around 1 p.m., they told us that we can now check-in. We paid Php 780 for the Triple Superior Room. The bedroom is spacious and clean. Our three single beds fits perfectly fine. We had air-conditioner, television, cabinet, four power outlets, trash bin, window, and a desk. The bathroom is clean and doesn’t have a bad smell. The toilet and shower areas has a divider in between which prevents water from flooding the whole bathroom floor. It has a lavatory and a mirror. Ong Bun Pension House Bacolod provides free Internet access via Wi-Fi but it is only available at the lobby. 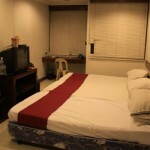 Food, airport, port, and tourist attractions are easily accessible from Ong Bun Pension House Bacolod. To catch the first ferry trip going to Iloilo City we had an early check-out at around 4:30 a.m.
Ong Bun Pension House Bacolod is affordable, clean, and spacious. It is good for budget conscious travelers, either solo or in groups. From Bacolod-Silay International Airport, ride a tricycle going to Silay city proper and take a bus ride going to Bacolod City. Jump off at Rizal Street and walk your way to Luzuriaga Street. You will find Ong Bun Pension House Bacolod in front of Central Market (formerly Diamond Hotel).